After seventy years of brutal Israeli occupation, genocide, ethnic cleansing, theft of their land, cold-blooded murders of their children, starving siege and destruction of all aspects of their life, the Palestinian people had given up on any help or support from any international community, who seem to be bullied and intimidated by Zionist agents. They also had given up on any help or support from Arab leaders, many of whom had originally accepted the 1948 partition plan and are lately talking about the alleged Jewish rights to live in their alleged god’s promised land and are talking overtly about normalizations with the Zionist terrorist state on the expense of Palestinian. They had also given up on any support from the Moslem world, whose countries are plagued with problems of their own, that were created by Western foreign policies. The Palestinian people; young and old, male and female, decided to take the initiative in their own hands and organized the “Great March of Return” to their own original homes in exercise of UN resolution 194 mandated the right of return of Palestinian refugees to their own cities and villages. Although their massive marches have been peaceful and under the Palestinian flag only, the Israeli army had met them with massive brutal force with all kinds of weapons. 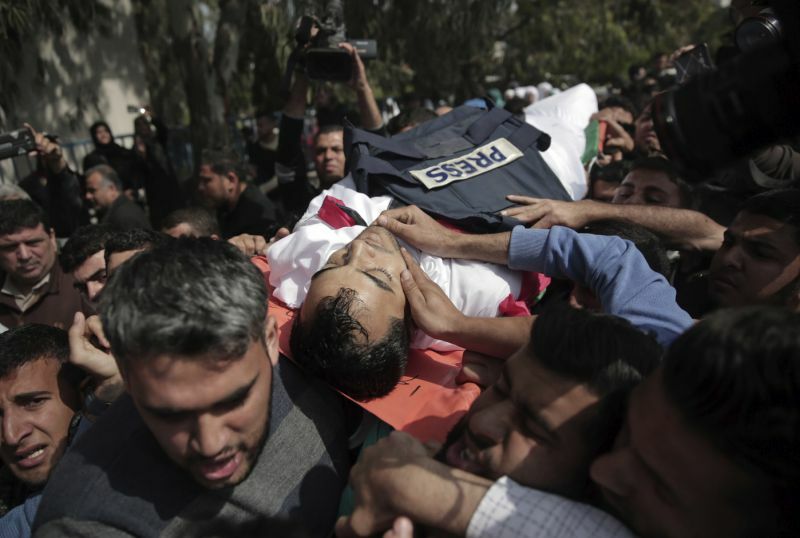 In their sixth week; May 4th, of the March of Return 50 Palestinians including children, women, medics and journalists were shot dead, and 8343 were injured, many of whom had sustained serious injuries including arms and legs amputations. The Israeli soldiers including 100 snipers, who were deployed to Gaza Strip, had used tear gas, rubber coated bullets, live explosive hollow-point bullets and unknown newly developed chemical gases that had inflected serious devastating injuries and fatalities upon the peaceful Palestinian marchers. Although these killings and injuries are clearly violations of all international laws and articles 27 and 47 of Geneva Conventions and are considered war crimes, the Israeli military leaders had encouraged and congratulated their murdering soldiers, who were shooting unarmed peaceful Palestinian marchers. “Nothing was carried out uncontrolled; everything was accurate and measured, and we know where every bullet landed.” Israeli military leaders tweeted. Yet despite these war crimes the Great March of Return is planned to continue until May 15th to commemorate the 70th year of Nakbah; Zionist occupation of Palestine, and in protest of the planned move on May 14th of the American embassy to al-Quds (Jerusalem) as the illegal recognition of the city as the capital of Israel. On Sunday April 15th the Arab League; 22 Arab states, had their 29th summit in Dhahran, Saudi Arabia to discuss the security issues of the Arab World. Originally, the meeting was supposed to commence in the United Arab Emirates, but the Saudi king had hijacked the meeting and hosted it in Dhahran; Saudi Arabia, in an attempt to enforce Saudi influence in the region, and to represent his son Mohamad bin Salman (MBS) as the major player among Arab leaders. Similar to all previous meetings of the League, the Palestinian cause received the usual symbolic but not any tangible support. The meeting was called “Summit for al-Quds (Jerusalem)”, rejected Trump’s recognition of al-Quds as capital of Israel, called for peace negotiations on the bases of the impractical, already dead two-states solution, and called Israel to recognize the 2002 Arab Peace Initiative. The Saudi king announced a $150 million donation for East Jerusalem to support the administration of al-Quds’ Islamic Property, and another $50 million donation to UNRWA in support to Palestinian refugees. These seem to be generous donations until one realizes that the $150 million are to be paid to Salafi clerics and groups to promote Saudi policies in occupied Palestine, and that the $50 million to UNRWA equals to only 10% of the price of the private yacht MBS had recently bought. The focus of the summit was not the fate of al-Quds or the Palestinian cause as the Saudi king wanted us to believe. The Palestinian cause is not a priority for the Saudi government as noted by MBS, who stated also that the Palestinians should accept Trump’s peace proposal “the deal of the century” or just shut up. MBS stated that Saudi Arabia has much more urgent and important issues to deal with such as Iran and Yemen. The real focus of the summit, as manipulated by Saudi king, was to divert Arab attention from the real Zionist threat to the alleged Iranian threat in support of terrorist groups in Syria and in Yemen. The documented facts the summit had ignored is that Iran, with Syria and Russia, has been the real fighter of the terrorist militia armies, who were created and financed partly by Saudi Arabia. The summit was encouraged to blame Syrian Assad’s regime and to demand international investigation of the latest alleged chemical attack, yet there was no condemnation of the day before the summit tripartite US/UK/France attack against Syria even before any investigation or confirmation of any chemical attack. Saudi Arabia, under the promise of financial and economic aid, had also manipulated the summit to gain approval and support for its fourth-year aggression against Yemen. In the shadow of the alleged Iranian threat and the war in Yemen, the Palestinian issue weathered away. Yet, Mahmoud Abbas; the Palestinian president, praised the Saudi king for his “generous” donations, accused Trump’s administration of violating international resolutions by announcing al-Quds as capital of Israel, called for the implementation of the two-states solution under the supervision of the International Quartet, and affirmed his efforts for reconciliations with Hamas although he accused Hamas of the attempted assassination of Palestinian Prime Minister; Rami Hamadallah, last March 13th. On Monday April 13th the lifeless Palestinian National Council (PNC) met in Ramallah, West Bank, with the absence of major Palestinian factions such as Hamas, who has the majority in the Palestinian Parliament, the Islamic Jihad, and the Popular Front for the Liberation of Palestine (PFLP). They, and other Palestinian political figures, requested the postponement of the meeting until better arrangement is made to allow all factions to attend. Having the meeting in Ramallah would threaten any faction members, other than Fateh, of being arrested by Israeli forces. The National Council is a legislative body that theoretically (not factually) represents all Palestinians at home and abroad. The previous meeting was conducted in Gaza 22 years ago in 1996. It was dominated by Fateh’s representatives while the Palestinian diaspora representations were mostly absent, had been pushed out by the Oslo Accord, and are still absent from any arrangements related to them. Mahmoud Abbas, whose term had expired on January 8th 2009 and has been administering the Palestinian Authority as a dictatorship, insisted on having the meeting in Ramallah despite the absence of major representatives. This placed serious ambiguity on the legal status of most of the attendees, who filled the meeting hall. This is a reminiscence of Arafat’s old tactic of overflowing meetings with his Fateh representative to gain votes for his favor. Abbas seems to have done the same in order to gain popularity for his own leadership in preparation for anticipated concessions for the long talked about deal of the century. It was reported that President Trump will announce his Middle East plan after his inauguration of the American embassy in al-Quds on May 14th. The plan is reported to offer Palestinians money to build their own capital somewhere else either in the West Bank or in Sinai desert. For the last seventy years the Palestinians had suffered the worst ever brutal occupation and genocide by the Zionist Jews, who much worse than the Aryan German Nazis consider themselves to be the elite of all elites, a sacred god’s chosen people, who are above all human races and above all international laws and can use brutal force to enforce their will on all humanity with divine impunity. Abandoned by their delusional selfish Arab leaders, abandoned by their misguided Christian and Moslem communities, and abandoned by the false self-proclaimed international righteous, legal and humanistic organizations, to weather away and die quietly, the Palestinian people, this new generation, decided to be the sacrificial martyrs; the Palestinian holocaust (sacrifice), who would rather die honorably while struggling for the dignity, the freedom, and the rightful return of their own people back to their rightful ancestral homeland. Their sacrifice; their murder by the Israelis, would be a dark stain on the human consciousness. Dr. Elias Akleh is an Arab American from a Palestinian descent. His family was evicted from Haifa, Palestine, after the 1948 Nakba when the Zionists stole his family’s property. Then the family was evicted again from the West Bank during the 1967 Naksah, after the Zionist, again, occupied the rest of Palestine.